We moved to Mull in 2002 and have been successfully running Sunart View B&B ever since - we have plenty of experience to draw on to make sure that your stay is an enjoyable one. Mike is an artist and I work as a photographer so our house has plenty of original artwork on display. You can see some examples of Mike's latest work on his website. Our rooms have stunning views of Loch Sunart and the Ardnamurchan penninsula. We have a double and a twin room - the double room is ensuite and the twin room has a private bathroom opposite. They both have freeview TV. A welcome tray is provided. Free WIFI is available. To see our rooms click here. Breakfast is self-service. There is a fridge and toaster availble for making yourself a continental style breakfast. Each room has a table and chairs so you are free to have breakfast at a time of your own choosing. Books and maps about the island are available for you to use during your stay. We are happy to help you plan your stay. And remember to bring your swimsuit! 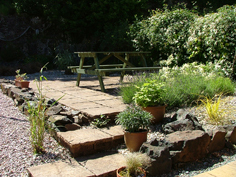 There is a large garden and plenty of space to park at Sunart View B&B. We also have a large garage for storing bicycles and motor bikes. Sunart View is a non-smoking B&B. Sorry but we do not allow guests to bring dogs. We now produce a range of fridge magnets - ideal for gifts or momentoes of your holiday on the Isle of Mull.